"In response to feedback we've received from you and others, we recently updated the checklists available at usgbc.org. Revisions include the addition of d/c designations, adding a notes section and unlocking the detailed version." Are there other improvements you think still need to be added? Suggest them here by leaving a comment! In my last post I forgot to congratulate the winner of the mini-contest where I asked readers to identify why the hell I featured two people sipping big gulps in a post about daylighting. My new best friend and suspected hipster (single speed... check! v-neck... check! manpurse... check!) The Beastmaster, authors two blogs (one for him and one for his family) and correctly guessed that the picture featured Matt and Kim, a band best known for their single, Daylight! Congrats! It's great to see that people are listening, especially on an important and controversial issue like LEED. Hopefully, with more feedback, we can have continuous improvement. Good work! LEED Green Building D&C Reference Guide includes a Prerequisite 2, Environmental Site Assessment. 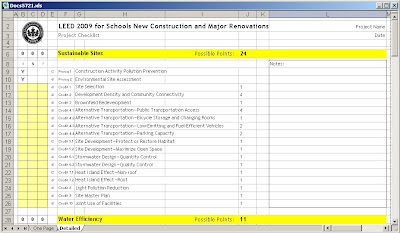 LEED 2009 NC Checklist downloadable from the USGBC website does not include Prerequisite 2, Environmental Site Assessment. What am I missing? The BD+C reference guide also contains info on credits for the LEED-CS and LEED-Schools rating systems since there's so much overlap between the three systems. That particular prereq is for LEED-Schools only. I can fix this myself with the checklists now that they are unlocked - but what's up with switching the order of the Yes, No, and Maybe columns? 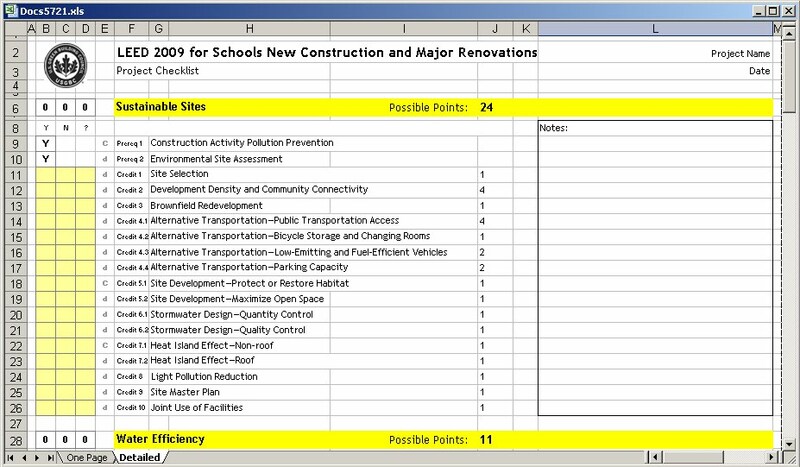 I would like to see the order returned to Yes, Maybe, No - from the current Yes, No, Maybe - like it was on all the previous LEED checklists prior to v2009. Can you get them to unlock the first worksheet? I would like to compare various certification scenarios at a high level. Nice job in fixing a real annoyance.